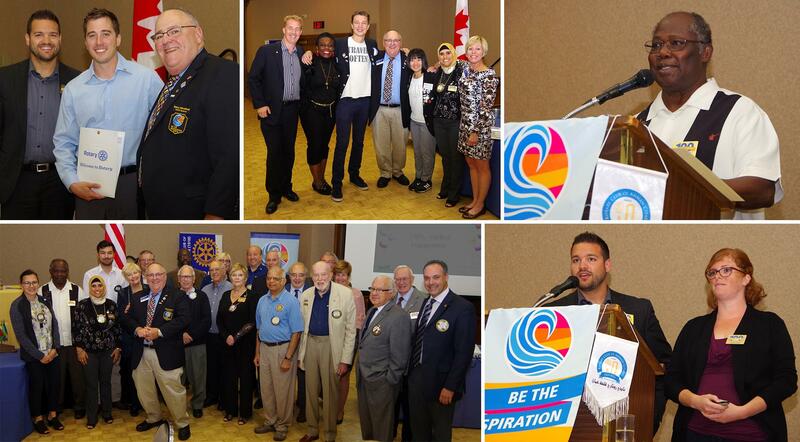 District 6400 Governor Paul Sincock visited the Club, Dr. Bacheyie accepted the prestigious Presidential Citation award, New Member Induction of Stephen Durocher, 100% Attendance members recognized and Young Rotary Leaders gave a recap. We had a packed program at the last meeting! First up, President Jules presented Dr Godfrey Bacheyie, who was awarded the Presidential Citation for his service to projects in Ghana, with his certificate. Recognizing that the strength of the Rotary ideal is founded on the service carried out by club members worldwide, this award recognizes members for outstanding work in Rotary's five Avenues of Service. Much thanks to Dr. Bacheyie's continued commitment to Service Above Self. Next, District Governor Paul Sincock addressed the Club, bringing with him the Voice of Rotary. He helped in the induction of our newest member Stephen Durocher, sponsored by Matt Lahoud. Mike Drake went on to present those members with 100% Attendance and then Allison Prieur and Matt Lahoud gave a breakdown about what the Young Rotary Leaders are all about, including the goals of the committee as well as past and upcoming events. To see more pictures from this meeting, Click Here.